With each temporary exhibition at the museum the staff thoughtfully arranges programming to complement the artwork and deepen the viewers understanding and appreciation of it. 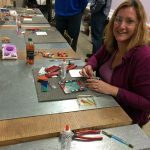 Make a unique memory with friends as you experience Art After Dark at Bergstrom-Mahler Museum of Glass in Neenah. Experience the current exhibition and museum collections in a more relax environment. Event is held third Thursdays, 5-7pm. The Glass Studio at the museum offers classes and camps throughout the year for both youth and adults using glass as the primary medium. Art Activity Days are held one Saturday each month from 10am-1pm. All are welcome to come to work in the studio on a pre-selected glass project. On the third Sunday in July for the past 44 years, Bergstrom-Mahler Museum of Glass has hosted the Arts Festival in Riverside Park as a fundraiser for museum programming. Learn more about the family-friendly event. Each December, the museum holds an open house to celebrate the season. All are welcome to create a fee-based project in The Glass Studio and create free make-and-take projects throughout the museum.